Attend the No One Is Above the Law protest near you, taking place Thursday, November 8, at 5 pm your time (local time). So, we at OTYCD wrote about the if-then protest in the past, when MoveOn.org and friends started planning it. We also urged you to visit the site and write down the details for your local No One Is Above the Law protest site in case a triggering event sends people stampeding toward the site from all over the Internet and the web page goes down. Welp. 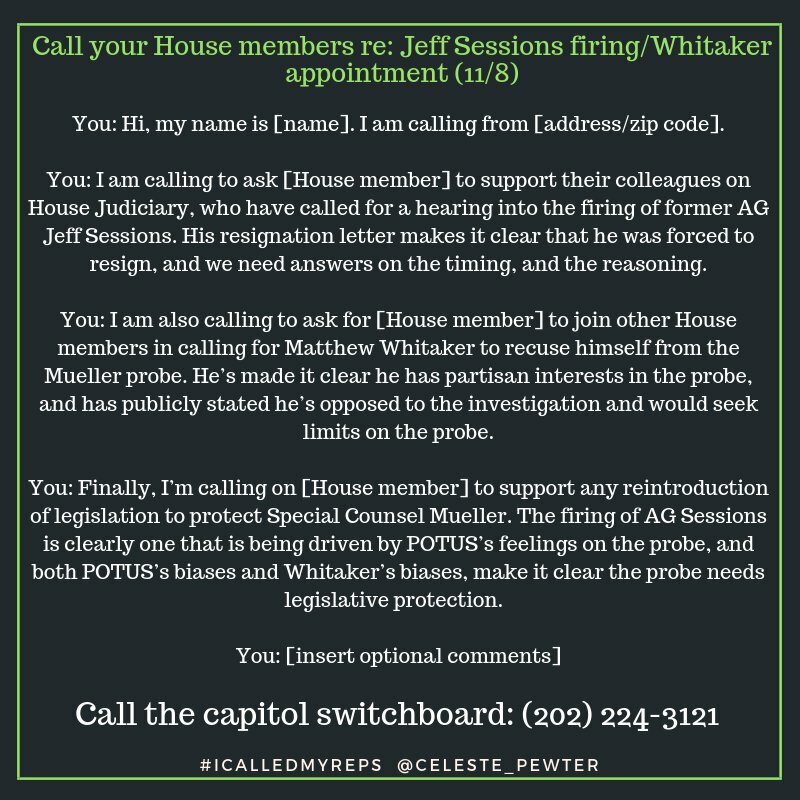 On Wednesday November 7, with the midterm results not even a day old (and some still trickling in), Trump compelled Attorney General Jeff Sessions to resign and installed an Acting Attorney General, Matthew Whitaker, who had been Sessions’s chief of staff. You can question whether any of this is legal. 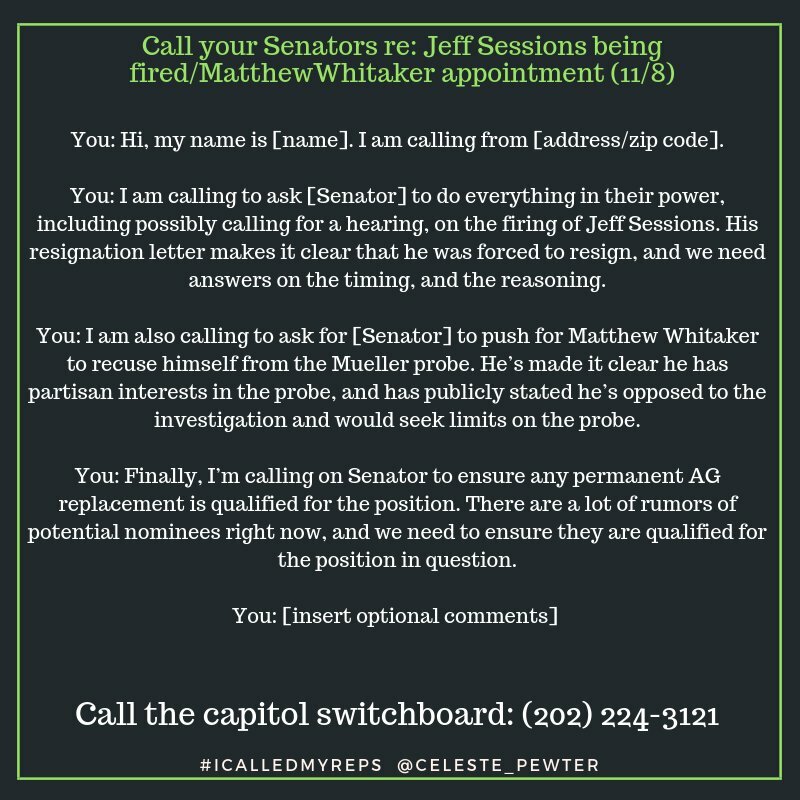 You can question whether Trump can put Whitaker, who is not Senate-confirmed, into the Acting AG role. You can question whether Whitaker has to recuse himself, given that he is on record as opposing the Mueller investigation, and has made comments about muffling it by starving it of funds. Rampant attack on our democracy? Yep. All that nonsensical fuckery was more than enough for the team behind the No One Is Above the Law if-then protest to pull the trigger on the event. You’ll also notice that the organizers didn’t quite follow the standing plan. They chose to set it for 5 pm local time to give folks more time to prepare. …So this might be a one-off, and it might not be. who you want to approach, in the spirit of making it as easy as possible for them to join. want to go, but can offer child-care services, that definitely helps, too. It’s best not to go alone; the bigger these protests are, the better. During the course of the day, watch the Twitter feed of Celeste Pewter (@Celeste_Pewter). ThisOTYCD post originally appeared in May 2018. In the lead-up to the midterms, we’re re-running important posts. Please click on the announcement from Sarah Jane to learn why you’re not seeing timely daily posts. Take a moment and note down the actual address and directions to the site where the Nobody Is Above the Law rally is happening closest to you. Just in case. We hope it won’t be necessary to rally. But if Trump actually fires Special Counsel Robert Mueller, or Deputy Attorney General Rod Rosenstein, or does some other ridiculous thing to undermine the Trump-Russia investigation and thus cause a constitutional crisis, you’ll need to be ready to go to your nearest protest site. As of late April 2018, more than 350,000 people have RSVPed. That’s good! But if Trump does the deed, there’ll be a lot more people than that who’ll be interested in going out to one of the 900-plus protests. Think about it. That 350,000 number represents those who intend to protest and who are comfortable filling out a form and giving their info to MoveOn.org. For every person who’s willing to do that, there are a bunch more who are only willing to do the first of those things. If you’re a regular reader of OTYCD, you’ve probably become The One In Your Circle Who Knows About Politics. Your friends and family will expect you to know where the Mueller Firing Rapid Response protest is, and how to get there, and where they can park. At the very least you need to go to the Mueller Firing Rapid Response page, find your protest site, and write down the name of the spot and its street address. Put it on paper. Put it in your phone. Email it to yourself. Heck, do all three. Even better, take some time and teach yourself how to give good, precise directions to the site, and learn what the parking options are. We’re saying this because if Trump does the deed–and remember, we know he’s threatened to do it at least twice and hasn’t carried through–it’s possible that the MoveOn.org site, which is hosting the Mueller Firing Rapid Response page, will be super-slammed in seconds, and it might go down due to the spike in traffic. Be prepared. Plan ahead. Take down the protest site info and put it where you can get it easily. Call your members of Congress (MoCs) to demand that Trump withdraw his invitation to host Vladimir Putin in Washington, D.C., in the fall. We at OTYCD hesitated to devote a post to this issue. We know Trump won’t withdraw the invitation. We know that any suggestion that he should withdraw will probably nudge him to double down. This request is not aimed at Trump. It’s aimed at the sane people who surround him and support him, and who make government work. If we, the constituents, don’t actually raise a ruckus with our electeds, they’ll convince themselves it’s not a big deal, and not worth their attention. This president is not normal. We’re already normalizing too many things, some out of simple exhaustion. Call your House Rep and demand Devin Nunes’s removal from his post as Chair of the House of Representatives’s Permanent Select Committee on Intelligence. Yep, we’re making an exception to our rule on issuing one thing you can do, per day, to push back against Trump. We need to get news out about the next Families Belong Together protest, but this needs attention, too, and it needs it today. Devin Nunes, who represents the 22nd District of California, has been a goddamn menace on the House Committee on Intelligence since Trump’s election. He’s seemingly made it his business to personally defend Trump instead of serving the American people. He should have been removed from the chairmanship of the committee ages ago. Paul Ryan, Speaker of the House, has consistently refused to do so. With the Department of Justice’s (DOJ) July 21, 2018 release of the FISA documents relating to Carter Page, it is abundantly clear that Nunes absolutely, positively has to GO. The fact that Trump went on a tweetstorm about this on Sunday claiming that the DOJ and FBI ‘misled the courts’ makes it still more urgent. While the documents are heavily redacted, every single knowledgable commenter on Twitter agrees that Nunes was stone cold wrong in his representations of what these documents contained, and his Democratic colleague, Adam Schiff, was correct. Here is a selection of Twitter comments to that effect. An important takeaway from the Carter Page FISA documents released today: They prove without a shadow of a doubt that @DevinNunes lied about the FISA warrant to try to discredit the Russia probe. And they also prove that @RepAdamSchiff told the truth. Devin Nunes won’t admit that he lied about Carter Page’s FISA warrant to undermine an ongoing investigation — but what about the rest of the GOP-led House intel committee, which largely went along with the Nunes memo? And what about @SpeakerRyan, who could remove Nunes tomorrow? So if @SpeakerRyan cares about accountability & oversight, what’s he going to do to hold @DevinNunes accountable for using his position as HPSCI chairman to lie to the American people, corrupt the oversight process, & undermine a federal investigation? There’s a full page of discussion of Steele being hired to conduct political oppo research, and why the FBI regards his reporting as reliable anyway. Makes the Nunes claim that they tried to hoodwink the FISC about this look even more ridiculous. What this does make clear beyond any serious doubt is the brazen dishonesty of the Nunes memo. It is impossible to imagine a reasonable person reading this document and then making the claims in that memo in good faith. about the FISA application by Nunes are just directly refuted by the FISA application. Utterly dishonest in its entirety. #FISA, that just upended 40 years of FISA practice that protected the nation’s secrets. national security information in cases involving #FISA going forward. So! We at OTYCD are asking you to call your House Rep and demand Nunes’s removal as chair of the House Intelligence committee. Before you call, check the links below that show the full list of members of the committee. Is your House Rep one of them? If so, it’s extra-important that you call. Also, if your House Rep is Speaker Paul Ryan? Super-extra-mega-important for you to call. Once you’ve done that, please support Andrew Janz, the Democrat who’s running against Nunes and hopes to take his seat. Donate to his campaign, phone-bank for him, canvass for him, follow him on social media–anything helps.